Recently I found few interesting questions about how to track custom variables with Google Analytics. The question well makes sense, even if your website is not a complex web application that your visitors log in to. “Simple” showroom websites could benefit from such kind information too, providing that you want to learn more about visitor behavior grouped by data not already included in stats. Here’s an example of how you can do this with Web Log Storming, but you might apply similar steps if you use some of other tools too. Let’s say that you run online shoe-shop. At some point, you decide to present a simple survey to your visitors and put results into cookie information. In this case, you would probably be interested in demographic information such is gender, age, marital status, etc. You get the picture. Put answers into a cookie and you’re ready for the next step. If these individual answers stay in visitor’s local cookies, you won’t be able to use them. It’s actually easy to “trick” a web server to write them down for you, and here’s how. First, create a transparent 1×1 pixel gif image and upload it to your server (for example: myvars.gif). For your convenience, you can get one from here (right-click on link and save image). You would probably want to replace $_COOKIE[ ] parts with your functions, but we’ll keep it as simple as possible here. Note the emphasized parts behind question marks. Instead of placing an image for each variable separately, you can combine them into one request, so your get ?g=female&a=40&s=married. It’s up to you how you want to track them later. Now we only need to extract these into a meaningful statistics. First, you can use Queries report to see how popular each survey option is. If you define your Goals in this report you’ll also be able to see how well each of visitor groups convert. 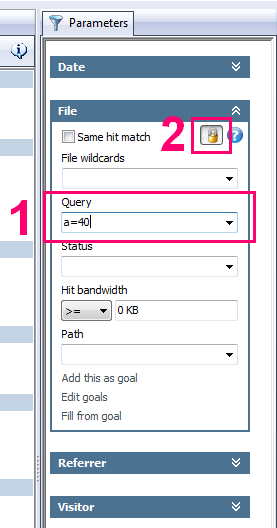 Type a filter into Query parameter (for example: “a=40”) and hit Enter. Whatever report you have active at this moment, it will now be based on visitors in forties only. Optionally, click Lock button to base all other reports you select on the same set of visitors, until you explicitly remove this filter. There are numerous combinations and possibilities, and for more info how wildcards work in Web Log Storming, check this page in the user manual. Note: if you decided to combine all variables into one request (ie. ?g=female&a=40&s=married), you’ll need to enclose filters in wildcard (asterisk) character, like this: *a=40*, +*g=male*. How to use these insights or “Why should I care”? Common sense tells us that our website should “push” male shoes to males and female shoes to females, right? But is it possible that it’s not the best choice? 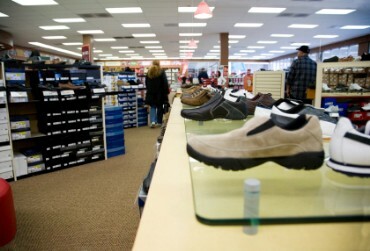 What if your analysis show that married middle-aged males often buy shoes to their spouses as a gift? You would definitely want to make it easier for them to do so. Or maybe you discover that divorced people, regardless of age, are more likely to buy more expensive shoes, so shouldn’t you present them an appropriate offers? Or maybe this doesn’t apply to divorced people in their sixties? Maybe people in sixties are generally not interested in expensive shoes, regardless of marital status? There is lot of questions which all make sense to me, but I’ll just stop – if someone told me month ago that I will spend this much time thinking about shoe market… 😉 Besides, I’m sure you understood the importance of visitor segmenting buy now and that you know what questions relate to you business. This entry was posted in Uncategorized and tagged analytics, analyzer, log, software, statistics, web on October 19, 2009 by Vladimir. This is a major issue, and, to be honest, we are glad so many people are aware of it. 🙂 Second graph above shows specific reasons. Web Log Storming is all about drilling into details. It allows you to to actually see list of sessions/visitors (filtered by any metrics) and all available details of each one of them (visitor data and individual hits). This allows you to react and easily exclude those you don’t wish to affect your statistics (for example, spiders, yourself, your employees, etc). Back to the topic: with Web Log Storming you can define goals any way you like, as opposed to GA which allows you to assign a goals to pages only. Goal can be a page, sequence of pages, query, an image accessed from a third-party website (useful if you confide payments to specialized services), bandwidth usage, etc. After setting a goal, every report shows conversion totals and percentages for each presented item (referrers, periods, pages, user agents, …) . One solution for cross-site analysis is already mentioned in previous point: embed an image from your web server in a third-party web page (it can be white 1×1 pixel gif, invisible to visitors) and all hits to that page will be noted in your stats. However, if you actually own and run several related websites, it would be nice if you could analyze them together. It’s not a problem for Web Log Storming. You should already have access to server logs, and all you need to do is to include them into the WLS project. It’s not even necessary for those websites to be on the same server – you can combine stats from IIS and Apache servers into joined reports. To easily distinguish hits from different websites, just use a Prefix option (/website1/index.html, /website2/index.html). In Web Log Storming, we tried to use as little technical terms as possible, and they are explained in a user manual page. By default, each report is described with one or two sentences at the bottom of the window, and user manual contains more detailed descriptions. Maybe it’s not enough, but we would like to hear any ideas for further improvements. You should really decide for yourself on this one… Point a) above (drilling down) should help you with it. I must admit that I’m not sure if I understood this one. I suppose that it’s related to the fact that free stuff is rarely good enough and other solutions are too expensive to consider? Well, Web Log Storming is really not that expensive (some say it’s too affordable for the value it provides). There’s no recurring fees and, once you buy a license, you can use it freely forever. You get free upgrades for certain time and, after that period, you can stay with version you own without paying a single cent, unless you decide that improvements are worth the upgrade price (which is discounted, of course). Log files (and thus statistics) exist even before you include tags. If you switch from one tag-based solution to another, you can kiss goodbye old data. If you switch from any kind of solution to a log-based solution, you still get all stats from the past. You’re not locked-in in any way. Code errors: omit a single but vital character and stats won’t work. Put a script code at the end of the page (as GA people suggests), and you risk that visitor will click away before page is fully loaded, resulting in lost hits. Put a script code at the beginning of the page and your website will become sluggish. Actually, total load time would be the same, but there’s more chance that visitors won’t notice it if code is at the end. Did you know that some people love to block Google Analytics and other similar tags? We are small company. Small companies, by definition, try harder. Every single customer and potential customer matters to us and we will commit any reasonable effort to make our software work for you in a way you want. We listen and welcome any new ideas and pursue any problem that you might have. Emails are responded by developers, not some independent (incompetent?) customer support service. Not everyone can set up a separate job place for an analytics specialist (and, according to the survey, 72% of contenders don’t). Initially, we made Web Log Storming for ourselves, and made it reasonably understandable and easy to use for people who’s job title doesn’t contain “analytics” word. Part of this benefit lies in its interactivity, allowing you not to dedicate your life to predict what information you will need in the future. When you get a new idea, just dig out that information from existing log files. That makes Web Log Storming a perfect solution for small businesses – get the right information at the moment you need it. If I would want to play silly, I would say that it’s now proved that Web Log Storming is 159.09% better than any other web analytics solution. 😉 But seriously, everyone should ponder all available options and choose what works best for them. Which web log analyzer should I use? This entry was posted in Uncategorized and tagged analytics, analyzer, log, software, statistics, web on October 12, 2009 by Vladimir.